$150 - $500 / All ad rotation campaigns come with a guaranteed number of page-views. The biggest Jerusalem content encyclopedia on the Internet. Jerusalempedia.com is a site that offers a full range of terms related to Jerusalem. Our Mission is to create the most comprehensive and definitive source of information available on Jerusalem anywhere. We are in the process of compiling the world's most comprehensive source of inter-related encyclopedic information sources covering every subject of Jerusalem to our visitors. At the current rate of 20 thousands unique visitors per month, Jerusalempedia.com is the primary source for information about Jerusalem. Demographics: 80% North America, 30,000 members. In addition to offering strategic campaign recommendations, we also offer extensive reporting capabilities through our "AD Butler" ad management software. Ad Butler is the most powerful advertising management software tool currently available. It efficiently tracks ad impressions and click-through rates, so you can monitor, compare, and assess the success rates of each campaign. Advertisers have open access to the statistics and can determine the progress of any particular campaign instantaneously. $200 for a guarantee of 50,000+ banner page-views. $300 for a guarantee of 80,000+ banner page-views. $500 for a guarantee of 100,000+ banner page-views. $550 for a guarantee of 120,000+ banner page-views. - No guarantee of length of ad campaign - just page-view guarantee. - The average campaign can receive between 40,000-80,000 page-views per month. 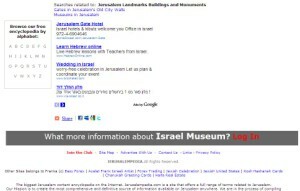 - Until the guaranteed number of page-views is registered, the ad campaign will remain on the JerusalemPedia site. Your text ad will appear 100% of the time - no guarantee of page-views.